THE Vitalizer Plus: Hexagonal Water GENERATOR - Technology that Awakens, Cleanses, Energizes & Revitalizes at the Cellular Level. A growing amount of evidence suggests that drinking Hexagonal Water has numerous health benefits. Hexagonal water moves more rapidly into your cells providing superior hydration, enhanced nutrient absorption, and more efficient detoxification. In the recently translated book, The Water Puzzle and the Hexagonal Key, Dr. Mu Shik Jhon explains that hexagonal water is the “functional” water unit within the body. According to his research, the hexagonal water structure surrounds healthy tissues, protects the DNA and supports a variety of metabolic functions. His research shows that both disease and aging are linked to a loss of hexagonal water in the body. 1. Hydrates the cells - Due to the penetration power of the smaller water molecules, Hexagonal Water are able to quickly move into the cellular environment of the body? Hydrating tissues and enhancing cellular functions. Many notice almost immediate energy. 2. Helps transport nutrients to the cells - Hexagonal water is the water of choice for all biological organisms. Its structure interfaces with the cellular components of our bodies and allows quick absorption of vitamins, minerals and other nutrients into the cells. Many have noted better assimilation of their supplements. 3. Enhances waste removal from cells - Water is also the carrier of wastes from our bodies. The efficiency of Hexagonal Water is often noticed within days by cleansing the body of long-held toxins and metabolic wastes. 4. Supports the immune system - Research has identified the critical role water plays in support of the immune system. Hexagonal Water has been found surrounding healthy DNA and other healthy proteins in the body. Other water structures have been found in conjunction with diseased tissues. Many, who drink Vitalized water, notice an improvement in their general health. 5. Improves cellular communication - When we are born, the water in our bodies is almost 100% hexagonally structured. This crystalline, hexagonal, water network supports efficient, almost instantaneous cellular communication which has been referred to in quantum physics as ¡°cellular coherence. 6. Increases metabolic efficiency - Water is involved in every process in the body. Hexagonal water has been shown to activate enzymes and enhance many other metabolic functions. Increased energy is a common result. The unique hexagonal structure created by the magnetic, far infra-red frequencies, vortexing (Brownian motion) and mineral ions, helps to support greater energy and the reactivation of weakened bodily functions. Create an unlimited supply of Hexagonal Water by using the Vitalizer Plus - it's small enough to sit on your kitchen counter - durable enough to make all the hexagonal water you will ever need. The Vitalizer Plus incorporates basic principles utilized in nature to create life-enhancing, hexagonally-structured water, your body craves. Nature uses movement (swirling vortexes and natural curves), energy (magnetic fields from the earth and far infrared energy from the sun), minerals (naturally dissolved as water flows over mineral formations) and oxygen (incorporated as water splashes and falls). The Vitalizer Plus uses these same principles, to create Vitalized Water in your own home! 1. Structure water - powerful magnetic and infrared forces reduce the size of individual water clusters, creating Hexagonal Water for more rapid penetration into the cells of your body. 2. Increase Oxygen - turbulent forces create a visible vortex, increasing the amount of oxygen in your drinking water - up to 30%. 3. Add minerals - a mineral core within the unit, releases structure-making minerals during the vitalizing process to help structure the water and increase alkalinity. 4. Add energy - the resulting energy in Vitalized water is enough to begin to balance the organs of your body - within minutes after drinking. Did you know that most filtered, bottled, distilled - even reverse osmosis water products, are acidic They contribute to the already chronic acidity in our bodies. Drinking alkalized water can make a difference, helping to move the body from an acidic to a more alkaline pH! Living water contains ionic minerals - incorporated naturally as water rushes over rocks and mineral formations. Minerals are considered the sparks of life since they are catalysts to nearly every metabolic reaction within the body. However, minerals must be in an ionic state - not suspended as in many colloidal products - in order to be absorbed and utilized at the cellular level. A balance of essential, ionic minerals adds "life" and a smooth taste to water. 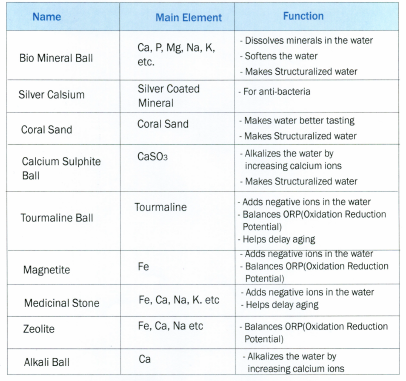 Certain minerals (Calcium, Sodium, Zinc and others) contribute to the hexagonal structuring of water. Other minerals (chlorine, fluorine, aluminum etc.) are referred to as structure-breaking minerals? they actually reduce the amount of hexagonally structuring in water. The Vitalizer Plus contains a mineral core, with a balance of ionic minerals from coral sand* and other sources, which are released slowly as the water swirls. Minerals include a predominance of structure-making ions: Calcium, Magnesium, Potassium, Phosphorous, Sodium and others. The resulting water is not only mineralized, but alkalized as well. *A word about coral sand: Coral sand (otherwise known as coral calcium) contains over 70 different organically-complex minerals and trace minerals. Coral, a once living organism, is one of the most balanced mineral supplements available. Not only are the minerals proportionately balanced, they have also been assimilated by a living organism and are therefore "organically complex" so that the human body can recognize and utilize them in an available form. As water trips and falls, splashing over rocks, it picks up oxygen. Oxygen is a purifier, reducing harmful bacteria and other detrimental organisms. Oxygen adds a powerful element to drinking water - especially in an age when the levels of oxygen on the planet have been seriously depleted. It is a scientific fact that bacteria, viruses and fungi cannot survive in an oxygen-rich environment. As such, the lack of sufficient oxygen becomes a significant contributor to disease and ill health. One way to increase the amount of oxygen available to our tissues is to drink oxygen-rich water. The Vitalizer Plus creates a vortex of spinning water - incorporating oxygen just like it happens in Nature. In fact, Hexagonal Water holds more oxygen than unstructured water. WHAT KIND OF WATER SHOULD BE USED IN THE VITALIZER PLUS™? 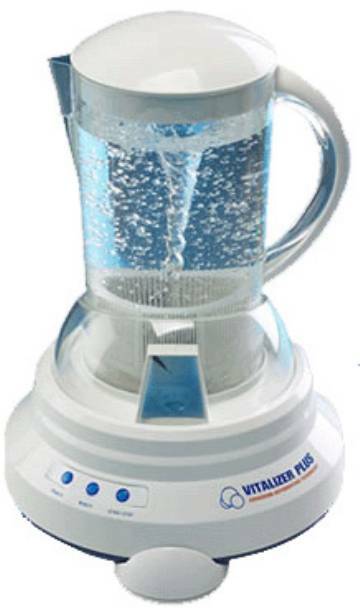 The Vitalizer Plus™ will structure any good water -- distilled water, RO water, bottled water, purified water, spring water and even well water if it comes from a pure source. Even though most water contains some vibrational pollution, the action of the vortex in the Vitalizer Plus™ will remove these frequencies from the water, leaving pure, undistorted, hexagonally-structured water. Many individuals can taste the difference. Because of the contaminants in tap water, it is not recommended that tap water be used.